This is the new research that counters the earlier evidences which told that usage of mobile and cordless phones causes cancer. Several researchers told that cell phone usage causes health disorders like skin cancers, brain tumors. One research that conducted in U.S told that it causes "Gliomas", type of brain tumor. To counteract this one other group of researchers starts study on people who are frequently using mobiles. It is not easy to conduct Randomized control trail. Because RCT needs to follow group of patients to a certain period of time and also it needs large test population. It is also very expensive to conduct. So they conduct case control and cohort study on 1,00,000 people over 10 years. They conduct study in 5 countries all over the world. They observe that the incidence of cancer is only to small extent i.e., 9 in 10,000 people. It is not that much severe condition. So, researchers telling that cell phone usage do not cause brain tumors. But we have to mind that the radiation releases from mobiles and cordless phones are very dangerous. They can affect health of pregnant women. They also dangerous to children aged below 10 years. 1. It affects pregnant health condition. 2. Affects children health especially brains. 4. May causes some types of skin cancers. So, we have to cautious about mobile usage. Especially pregnant women must use head phones while talking in mobiles. Parents never allow children(less than 10 years) to use mobiles more than 1 hour. Every one should use radition free mobiles to save ourselves from radiation. 1. Never sleep with mobile under your pillow. Keep mobile at least 10-20 meters away from head. 2. Always use left ear for mobile talking. 3. Never talk by mobile at the time of mobile charging. 4. Never talk by mobile when it is having low battery level (below 10%). At that time the radiation is 1000 times more than normal. 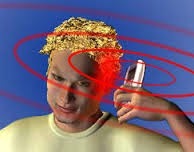 Note: Check your mobile radiation by dialing *#07#. If it is less than 1.6 watt/kg its fine but if it is not showing any thing after dialing *#07# then immediately change your mobile as it is having more radiation that is why it is not showing any thing. Common Symptoms of Cancer in Females.